I love chapter eight of Steal Like An Artist! The title is: “Be Nice. (The world is a small town. )” If you’ve hung out in the world wide toy community of Instagram for any length of time, you know how very true this statement is. It is easy to be influenced by all the great toy photography being posted on Instagram, Flickr, G+, Facebook and misc blogs. I myself have borrowed an idea or two over the past few months; no one is above being influenced by their peers. So lets review how to steal like an artist. (This handy little chart, from the book by the same name, is a great guide.) When you “steal” it is about incorporating, not recreating verbatum. If you take a great idea and put it through your own internal filters, it is bound to come out completely different. If you transform and remix your inspiration, especially if your inspiration comes from several sources, you will no doubt end up in a completely different place from where you thought you were going. In my experience it will be a better, truer place, which really is the whole point. Right? Remember, it’s a small world and social media sites like Flickr and Instagram have shrunk it just a little bit further. So follow this guide and your work will flourish and no one will be accusing you of being that guy or gal. Definitely give credit though, if only so that the original artist can see your interpretation of their idea. Mike I also like the left column. I think it’s hard not to be inspired by photographs or particularly well executed ideas on IG. It;s juts good to be aware of when and how you do it. Then you can give credit when credit is due. Thanks for reading and commenting! Great post… I love the toy photography community. I’m inspired by many of the photographers and try to capture the effects, hopefully I’m not being a “Bad” thief. Thank your for reading and commenting. We all are inspired daily by the amazing photography in the toy community. 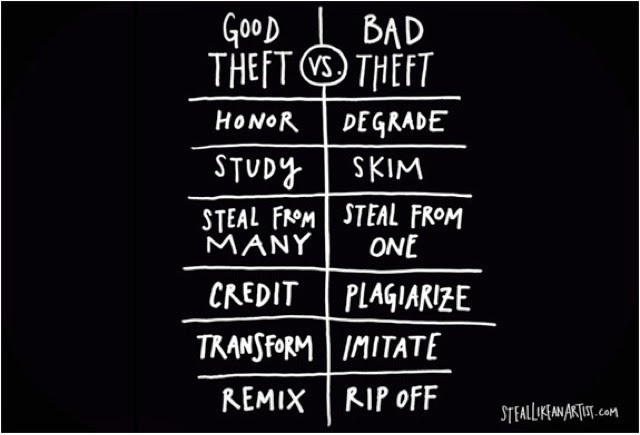 The line between “good” theft and “bad” theft is a fine one. But if you are aware of your influences I am sure you will know when it is time to give credit. Thanks again!